The Swiss based aircraft manufacturer Pilatus made a splash at the biennial Australian International Airshow (Avalon) this year with the installation of a full scale mock up of an innovative new business jet. 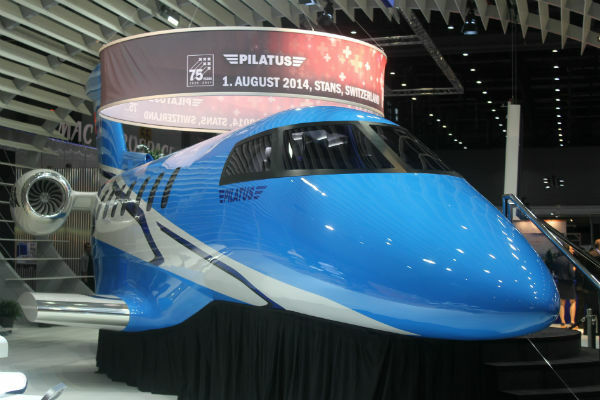 The jet was the star attraction on the Pilatus stand which was the largest exhibition stand at the show. Here at 200m2, we’re always impressed when we see exhibits like this. Aside from the logistical challenges which exhibition stands like this represent, exhibits like this provide a number of other challenges. Stage management is absolutely crucial. Over the years at 200m2 we have managed many boat show exhibition stands where luxury yachts are showcased to prospective buyers. The challenge is to ensure the exhibit remains accessible to all whilst keeping it open to key prospects at the time they want to visit. Flexibility is key. Visitors to the impressive 400 square metre Pilatus stand, including the Hon Kevin Andrews MP, Australian Minister for Defence, were able to view the showcase replica of the 17 metre long aircraft which is the world’s first ever business jet designed for use on short, unprepared runways. The biennial Australian International Airshow or Avalon Airshow, held at Avalon Airport, near Melbourne, Australia, from 24th February to 1st March 2015, is one of Asia Pacific’s most prestigious aviation, aerospace and defence exhibitions, attracting high profile visitors from all over the globe. Previous Previous post: How to brew the perfect exhibition stand!